Grip in all directions assures maximum hold and non-slip jaw action. High carbon steel construction for strength. Adjustable tongue and groove design. NOT recommended for electrical use. Chrome vanadium steel construction for durability. Bright nickel plated, rust-resistant finish. The handle swivels to avoid obstructions making them ideal for hard-to-reach filters. 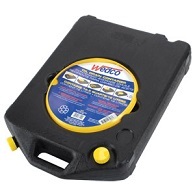 Oil-resistant, all purpose plastic pan with built in, raised rim handles.